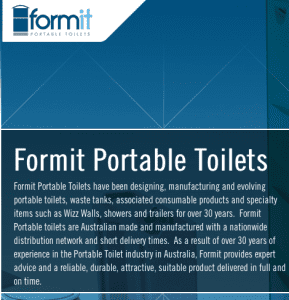 Kazema Portable Toilets have partnered with Formit Portable Toilets, Australia to distribute the Portable Toilets over the Middle East region starting from 2013. Formit Portable Toilets have been designing, manufacturing and evolving portable toilets, waste tanks, associated consumable products and specialty items such as Wizz Walls, showers and trailers for over 30 years. Formit Portable toilets are Australian made and manufactured with a nationwide distribution network and short delivery times. As a result of over 30 years of experience in the Portable Toilet industry in Australia, Formit provides expert advice and a reliable, durable, attractive, suitable product delivered in full and on time.